Speed Optimizer Pro is an application that claims to optimize your operating system in order to make it run faster. The category known as potentially unwanted program is vast as it includes various browser add-ons, desktop programs, dubious antimalware tools, etc. Due to the questionable ways it functions and ways of distribution Speed Optimizer Pro in the virtual security world was also dubbed as a potentially unwanted application. The ambiguous nature of the program might not be enough to convince the users to remove it; therefore, we provide further information about Speed Optimizer Pro and a detailed removal guide. The way that Speed Optimizer Pro is distributed is one of the main reasons why you should not entirely trust this application. In quite a few cases, Speed Optimizer Pro comes bundled with various third-party download managers. This way of software distribution is seen as a dubious one as it is invasive and misleading at times. Often users’ tendency to skim through installation is exploited as a lot of bundled software tends to inform the user poorly about the additional installation of third-party software. In order to prevent similar programs and Internet-based computer infection of entering your system, you should pay extra attention while downloading or installing any software. Always read carefully what you are presented with during the installation process. Download software only from the official publishers’ website as it is your best bet to avoid bundles. Furthermore, you should implement a professional antimalware tool to avoid any threatening installers. Once Speed Optimizer Pro is on your system it displays the details of your operating system and allows you to scan different parts of it. After the scan, the results will suggest system optimization. 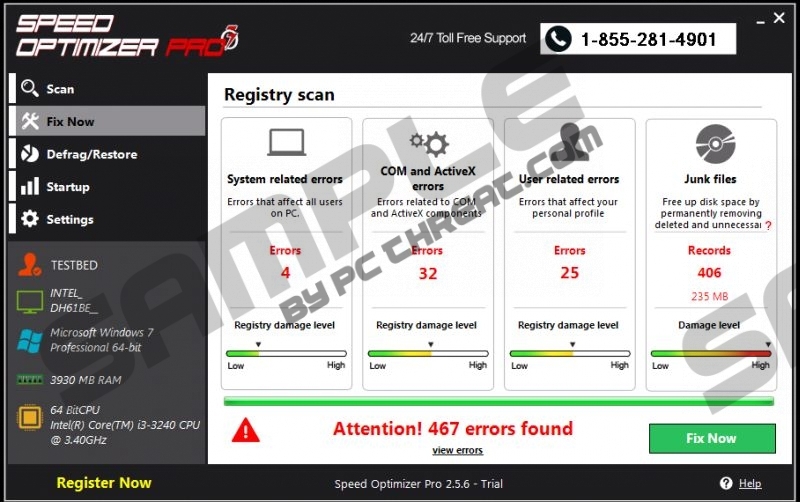 The results seem legitimate as Speed Optimizer Pro can identify actual system-related errors, user-related errors, junk files, etc. The only dubious results are about the temporary files. In reality, temporary files do not stay long on your system. This could be a trick used in order to display more results Speed Optimizer Pro chooses to include the temporary files. Unsuspecting users might be manipulated in this way. There a more reliable tools to optimize your system out there and as we can see Speed Optimizer Pro is not one of them. Although Speed Optimizer Pro is not an aversive and malicious application, we do not suggest keeping it on your system. In some cases programs like Speed Optimizer Pro can be a cause of other infections, espcialy regarding the dubious ways it is distributed. It is quite simple to remove this particular application, especially because it can be uninstalled via Windows Control Panel. We include a detailed removal guide below. If you will follow it carefully, you should not encounter any problems. Remember that in a lot of cases Speed Optimizer Pro would not have infiltrated your system if you were running a trustworthy antimalware application. Locate and uninstall Speed Optimizer Pro. Select and uninstall Speed Optimizer Pro. Select and remove Speed Optimizer Pro. Quick & tested solution for Speed Optimizer Pro removal.